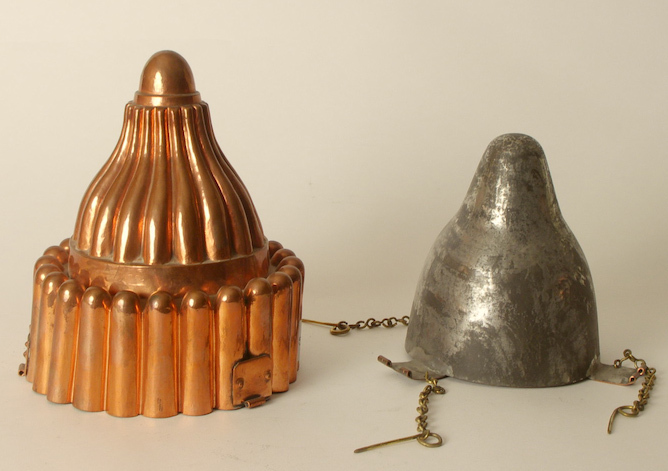 Perhaps the most singular culinary expression of the advance of the Industrial Revolution in Victorian Britain was the extraordinary popularity of mass-produced copper jelly moulds. By the middle of the nineteenth century the fashion for this kind of kitchen kit had accelerated into a gastronomic craze. 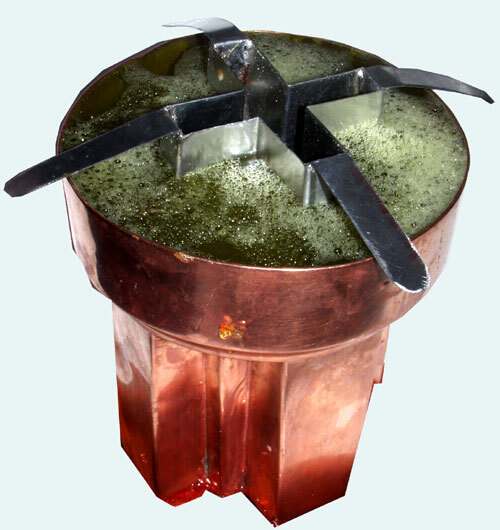 This was the result of the convergence of two emerging phenomena - the availability of cheap factory made gelatine and the increasing use of powerful pneumatic presses to stamp out copper into ever more intricate shapes. After a hundred years of being an unloved, even despised children's party food, a jelly revival has once again recently hit the fashionable food sector. 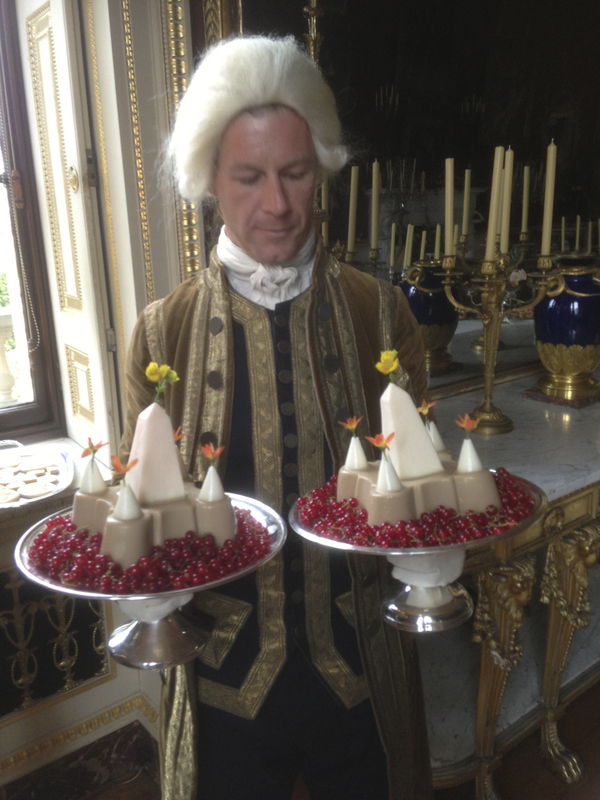 This was started about twenty years ago by my dear genius friend Peter Brears and to a lesser extent by myself, when both of us started running country house events where we recreated jellies and other moulded foods for the public using original period moulds. I also started running courses on the subject in the early 1990s. More recently, Sam Bompas and Harry Parr, both attendees of my courses who have always kindly acknowledged the debt they owe to Peter and myself, have made a career for themselves out of the genre. 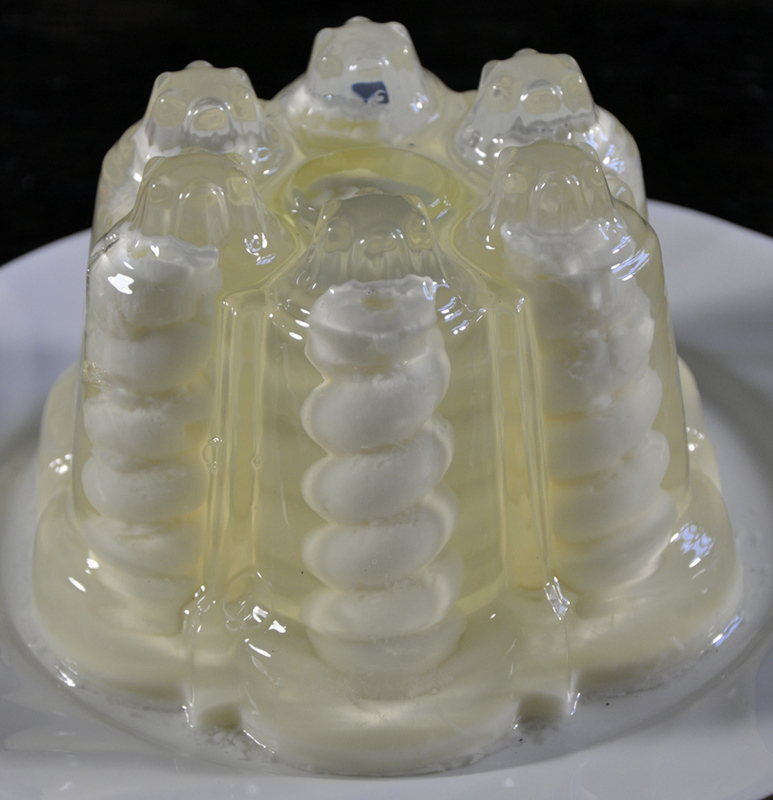 However, despite modern computer 3D printing technology, the moulds available to the contemporary aspiring jelly maker just cannot compete with those of the Victorian kitchen. Just look at these! This mould was utilised by pouring a transparent jelly into the gap between the mould and the liner. 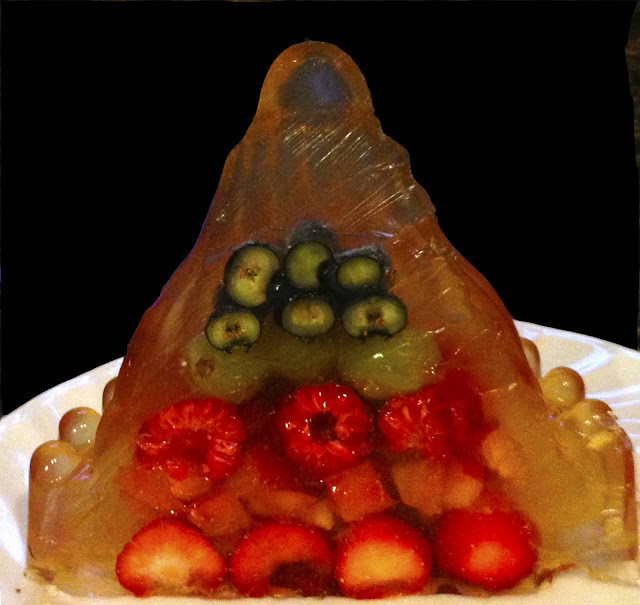 Once the jelly had set, warm water was poured into the liner, which enabled it to be removed. Small pieces of fruit (the 'macedoine') and more jelly could then be used to fill up the resulting cavity. 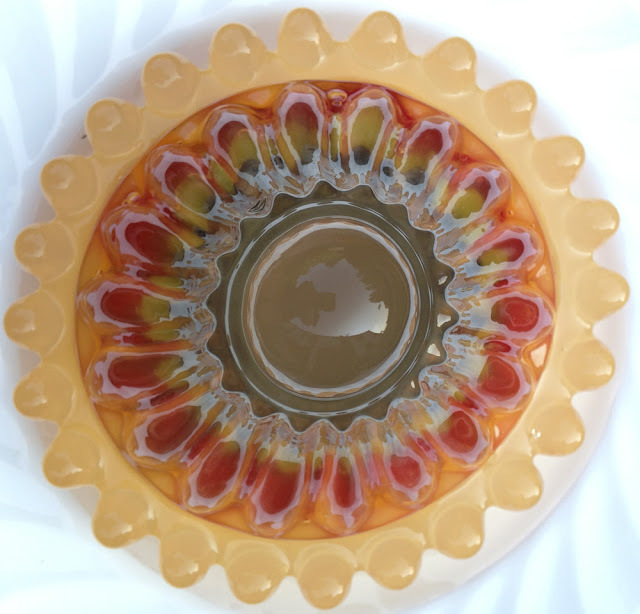 The finished dish was a striking hollow jelly containing a mosaic of coloured fruit, which distorted into an abstract pattern because of the effects of refraction caused by the flutings on the mould. I am fortunate enough to own a complete macedoine mould and used it to make the jelly at the top of this posting. However, my example is a different design from that which Dubois illustrates, though in principle it functions in exactly the same way. 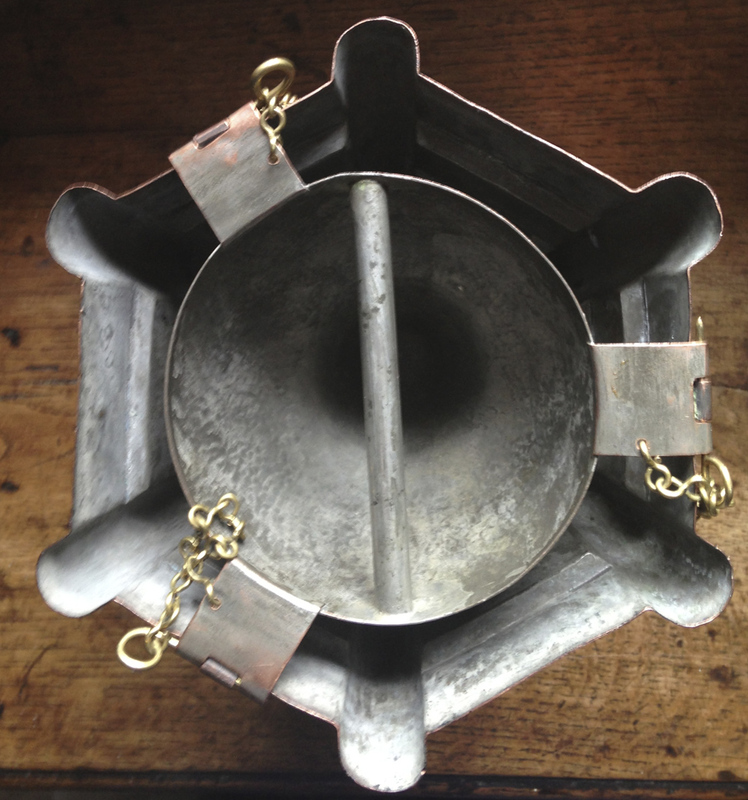 Although macedoine moulds are extremely rare - I have only ever seen two others, which lacked their liners. My example is the only one I have ever encountered which is complete. Here are some photographs. The chained pins ensure that the inner liner is kept stable and at an equal distance from the outer mould. 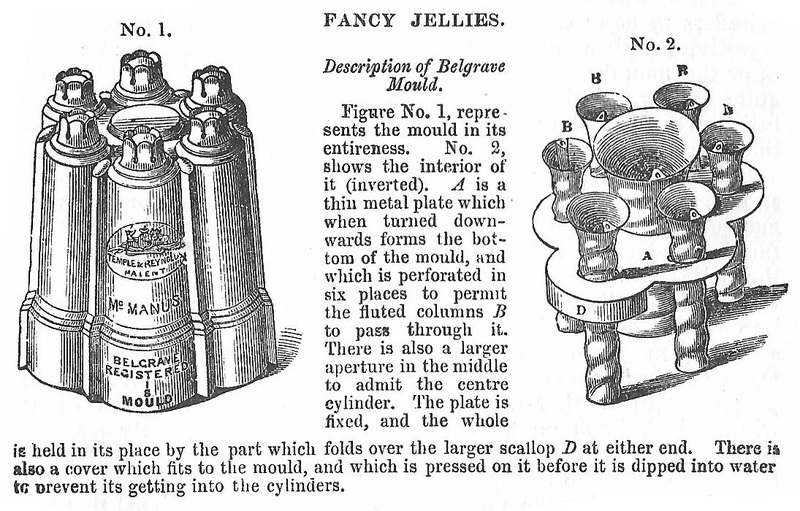 Macedoine jellies were also be made in plain moulds. The striking example above is from Jules Gouffé, The Royal Book of Pastry and Confectionery (London: 1874). A large plain charlotte mould would have been used to make this. It has been garnished with jelly croutons to create the crest around the top and is surmounted by a gum paste or nougat tazza filled with real or ice cream strawberries. Although a very weak jelly with a light 'mouth feel' was used to make a macedoine, the fruit inside acted as a very strong armature which could support a decorative structure like the tazza above. 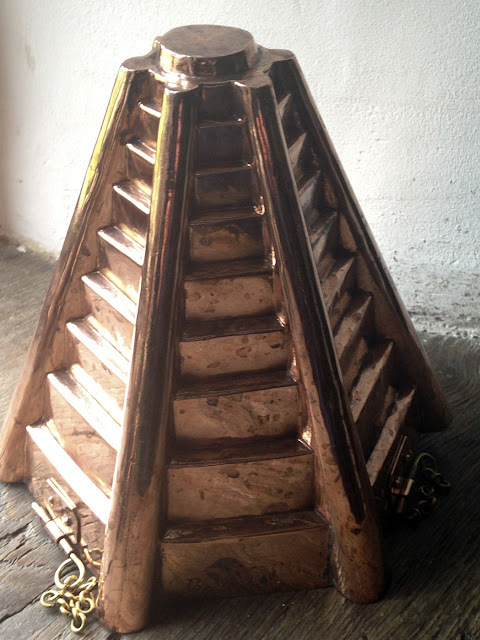 Even rarer than the macedoine mould illustrated by Dubois is this remarkable and lovely version, which reminds me of a Maya pyramid or ziggurat. 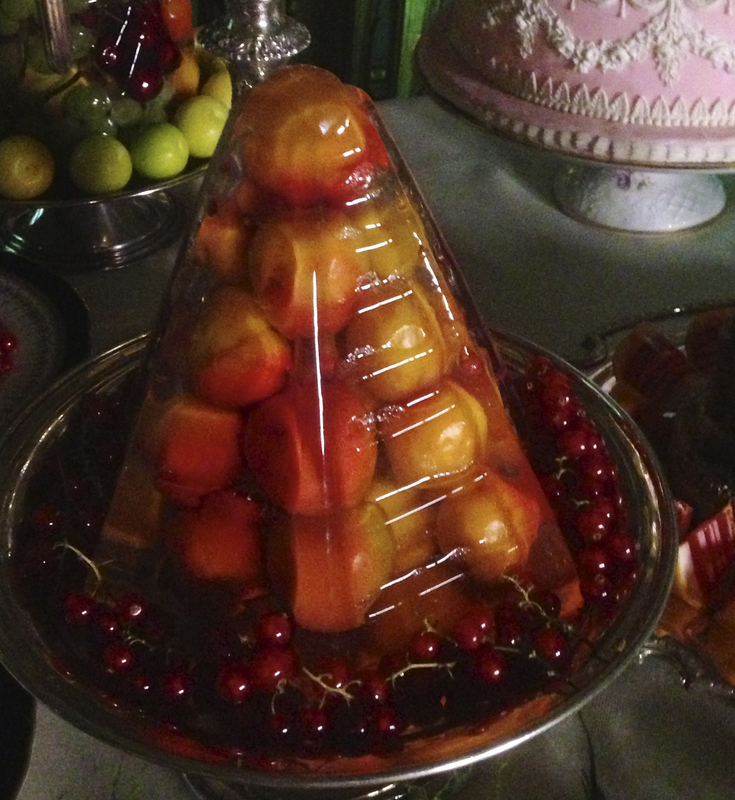 It has a liner very similar to the other one and makes the most wonderful jelly filled with a pyramid of fruit. I have never ever seen another in this design. 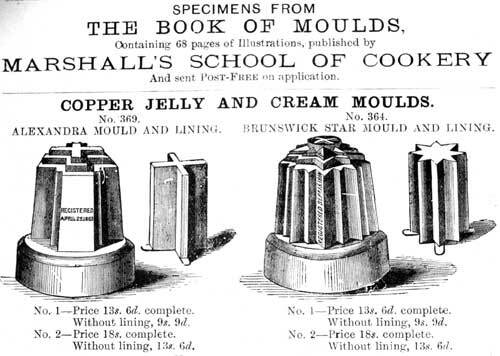 The second English mould illustrated by Dubois in Cosmopolitan Cookery (1870) is a version of a very popular novelty mould first marketed by Temple and Reynolds of Belgravia in 1850. The location of their shop gave the name to this particular dish, the most extraordinary of all Victorian novelty jellies, the Belgrave. 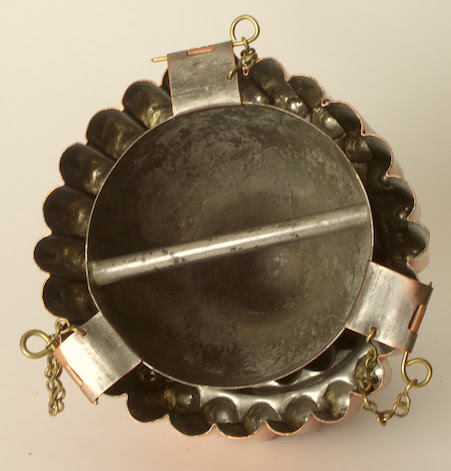 The outer copper moulds are quite common, but a complete set with a full compliment of pewter spiral liners is a rare find. Two versions were made, the round and the oval, the latter being very scarce now, especially with liners. 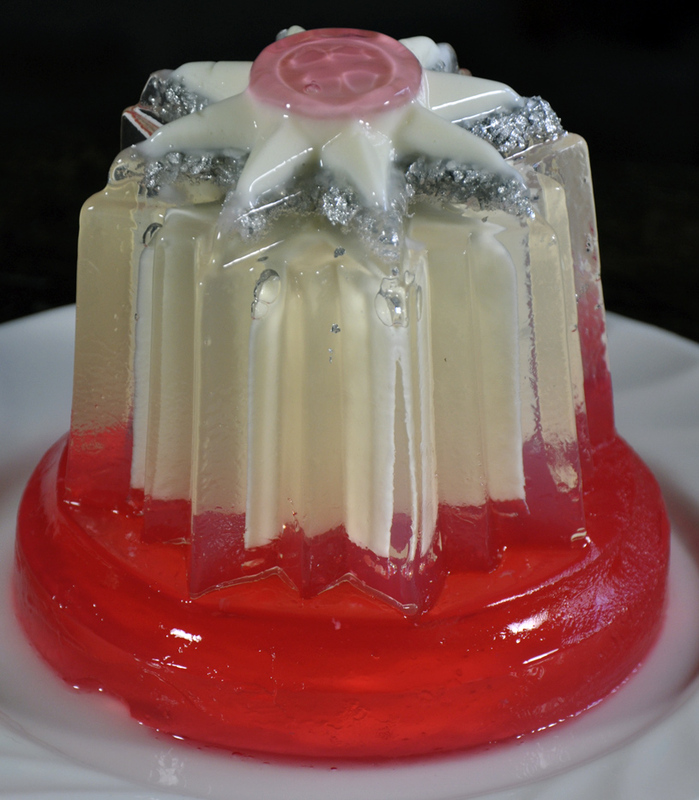 The liners were placed into a jelly mould which was filled with clear jelly. When the jelly had set, the liners were literally 'screwed' out of the jelly by pouring hot water into them. 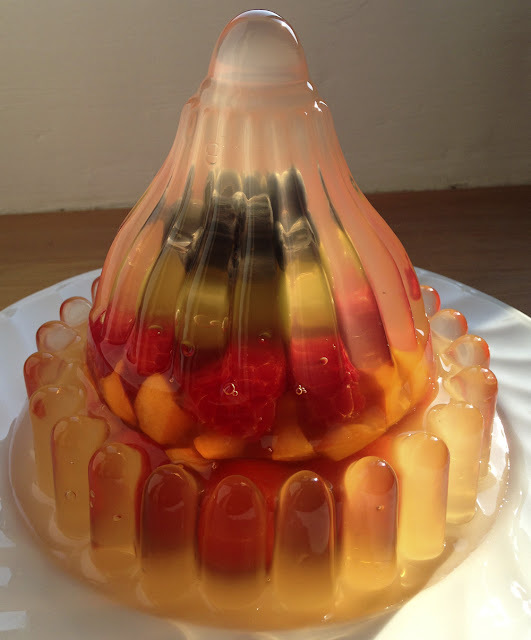 This resulted in a number of spiral cavities which could then be filled with a coloured jelly or blancmange. The two most common jelly moulds which included liners to create striking internal features were the Alexandra Cross and Brunswick Star. These were designed to celebrate the wedding of Queen Victoria's eldest son Edward Prince of Wales to Princess Alexandra of Denmark. The Alexandra Cross jelly had the Danish Flag running all the way through it, while the Brunswick Star had a white Garter Star running through it, both rather like a stick of rock. Here is an advertisement from the 1890s published by the cookery teacher and mould retailer Mrs Agnes Marshall. Surviving liners are almost unknown. To make both, coloured jellies were poured into the mould in a particular order and then the liners were inserted. The rest of the jelly was poured in around the liner, which was removed by pouring hot water into it. The cavity was then filled with white blancmange. About three years ago I manned the wonderful period kitchen at Harewood House and demonstrated period jelly making to the general public. 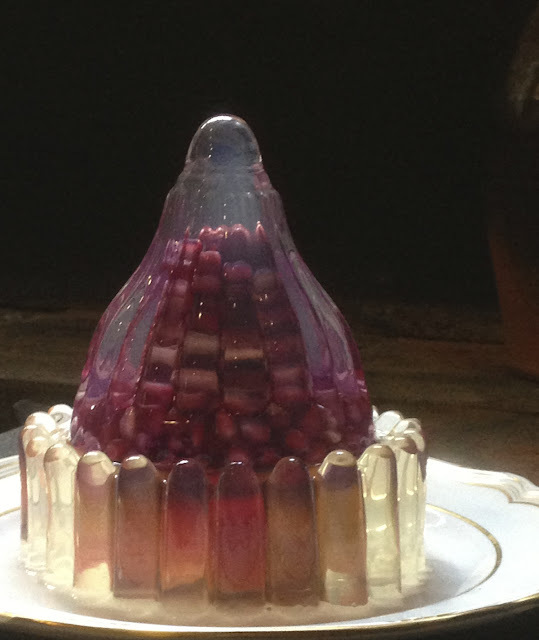 As the jellies came from the moulds, I dressed the dining room with a typical Victorian entremet course using Princess Mary's priceless Venetian glass dessert service. Last week I was at Harewood again, this time dressing the kitchen and gallery (the most wonderful room in England) with Regency period food for a major forthcoming BBC drama production, which I will tell you more about after it has been transmitted at Christmas. 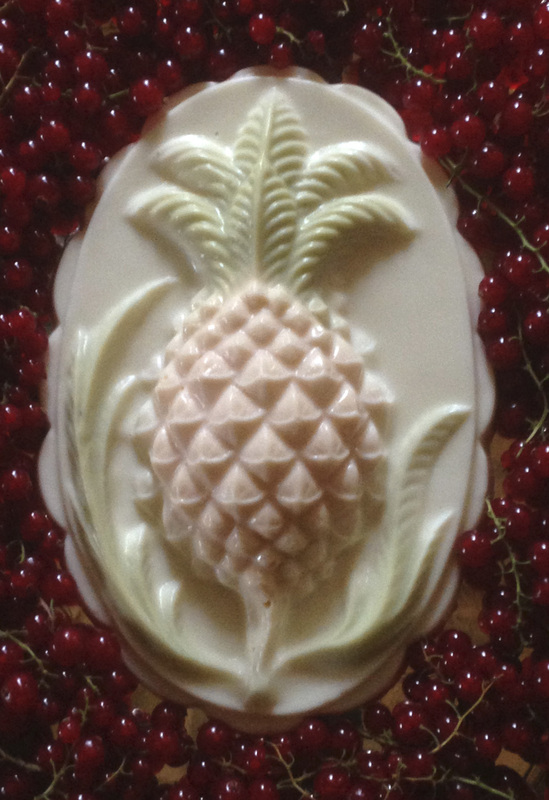 I made a large number of jellies and blancmanges for this production using Staffordshire ceramic moulds made in the late eighteenth and early nineteenth century. To whet your appetite, here are a few photos. As you can see, the Victorians were not the only ones to have beautiful moulded foods - the late Georgians could give them (and Bompas and Parr) a real run for their money. Ivan - looking at that hedgehog jelly, I can't help but wonder if there is some connection with the later Armadillo mould that was produced by Wileman/Shelley. 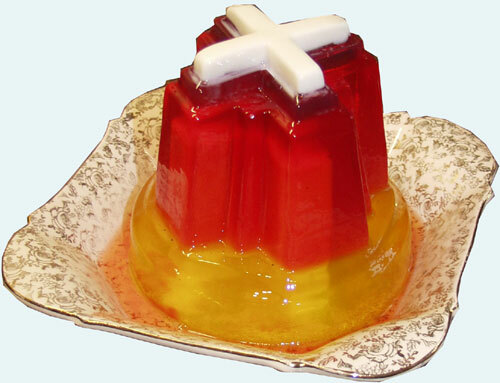 Did other European countries go in for moulded jellies? I've seen some German moulds labelled as "puddingform", but these are all very shallow, including a "sleeping lion" example. I haven't seen much evidence that the French or Italians were interested in moulded jellies? 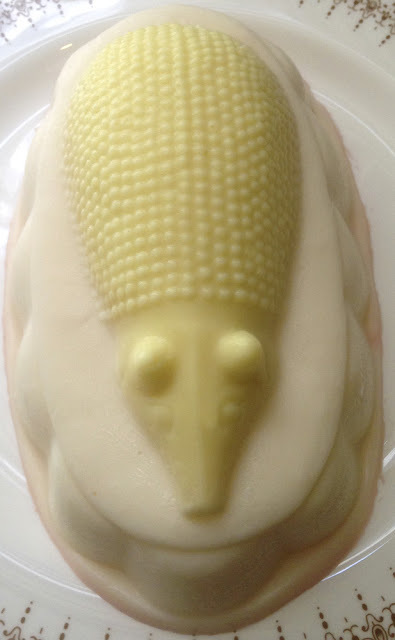 Adam - The hedgehog flummery moulds probably emerged as a result of the popularity of an eighteenth century dish called 'A Hedge-hog', usually made by working almonds to a paste and cooking them with egg yolk, egg whites and cream into a thick malleable paste. This was shaped by hand into the form of a hedgehog and then struck with blanched almonds for the bristles. I have seen a number of Staffordshire hedgehog moulds from the second half of the eighteenth century which enabled a similar dish to be made with less artistic effort. I am sure you are right, the well-known Shelley armadillo mould is an early twentieth century incarnation of this tradition. Other European countries, particularly France, were very fond of moulded jellies, at least in the nineteenth century. 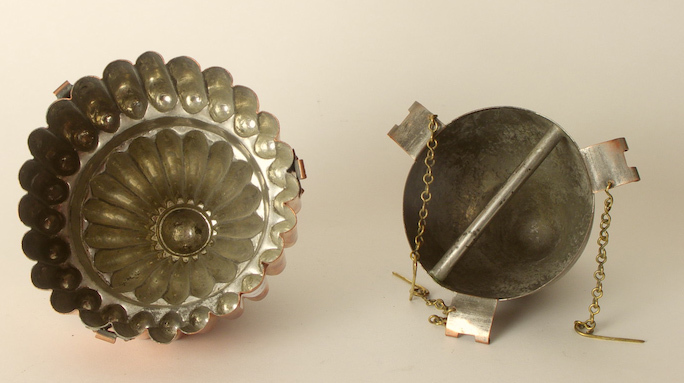 In Paris, the celebrated mould manufacturers Trottier led the field with a large number of designs. However, it must be understood that these moulds were often designed for a multiplicity of purposes, not just for jelly. Some were also used for moulding bavaroises, for steaming puddings and for baking cakes. The evidence points to the fact that some of the great French chefs of the nineteenth century thought highly of English moulds, which were very well made. 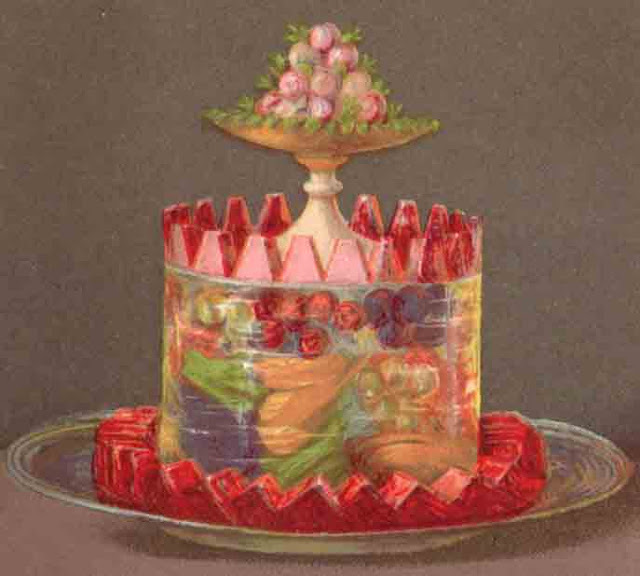 Moulded jellies are illustrated in a number of nineteenth century Italian recipe collections. Ivan, I do believe that you are a supernatural being and would love to share your posts with others. May I somehow do that on one of my blog posts? I am always blown away by your posts. Thanks for the kind words, though I am afraid I am entirely flesh and blood and of this world! But please - yes - share my posts and spread he word! What is the silver-appearing substance in the gorgeous "A finished Brunswick Star jelly"? These bring back the memories of the 1950's, my mother and her friends trying to outdo each other with their molds...nothing as spectacular as you have created! It is silver leaf. 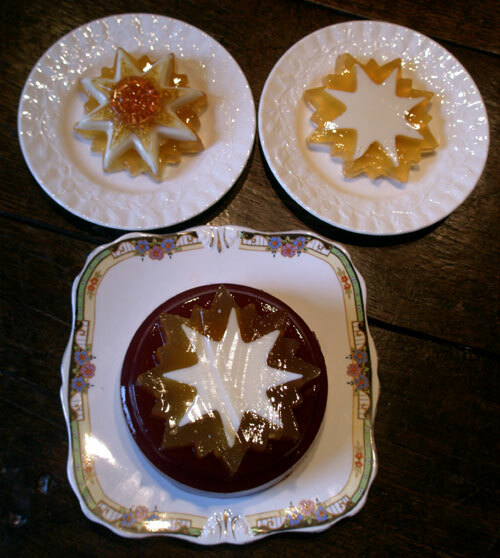 I made this according to the directions given in a late nineteenth century set of instructions by Mary Jewry for using the Alexandra Cross and Brunswick Star mould, which instructs the reader to fill the star with a transparent jelly and 'silver leaf or silver bran'. I'm having a hard time commenting so please forgive me if you are getting multiple postings! What a beautiful and fascinating post - I love elaborate jellies. May I please post to my Facebook page? thank you for your kind words. Of course you can post to your Facebook page. Please do! This is wonderful! You have really found some great things. I cannot imagine the time it took to prepare. Can you share the recipe used for the sun and moon?? These jellies are beautiful! I would love to have one of them served to me! Just saw your blog on a google search. It's nice to know there are other people out there who love culinary history like I do. So beautiful and inspiring! I was given a pure white, fine, porcelain octagonal mold from the 20's - I think. It is fluted and more vertical than horizontal with lots of sharp angles. 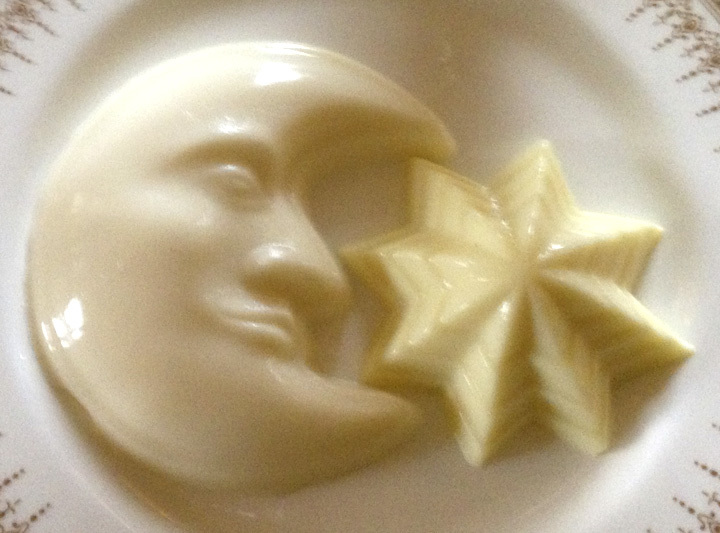 Am planning to try a pale two-tone blancmange - think it would be beautiful. However I see that all of your vertical molds are metal and de-molding instructions include: hot water and running a knife inside the mold, too many angles! Is this mold intended only for baking? The blue stamp on the bottom says OCTC London. Thank you for your help.